There was a day that when an offense got inside the two yard line it was automatic that there would be some beef trotting in off of the offensive team’s sideline. The offense was going to get into some type of 23 or 32 personnel formation and commence to attempting to impose their will on the defense for one or two yards. These days it is still out there but not nearly as much. Many offenses will stay in their normal offense and let it ride even if it is a spread offense that doesn’t match up nearly as well with the shortened eleven or twelve yard vertical field you are playing on in this area. There is some merit to this, after all, it is one less thing to work on and this defensive advantage is only an advantage if the defense takes advantage of it right…? There are risks involved though if you don’t get into a more traditional goal line formation. Just ask the Miami Dolphins who just a few weeks ago thought that running the read option on the one yard line was a good idea out of a 2×2 formation against the Chicago Bears for an almost certain win. The Dolphins will tell you that their execution caused what was a catastrophic error and fumble that was recovered by the Bears. Deep inside though, they were kicking themselves for ever thinking they should do that in the NFL on the one yard line with the game on the line. Fortunately for them, they ended up winning but the lesson had to be learned. But we digress… Back to our original thought and point. If you have blocking tight ends or extra offensive linemen on your football team there can still be a place for 32 personnel and a traditional goal line attack. This will give you the ability to protect the edges, take a secure snap one yard from the goal line not five yards away in the gun, and attack the defense downhill for the one or two yards you need. All 32 personnel goal line runs are not created equally however. 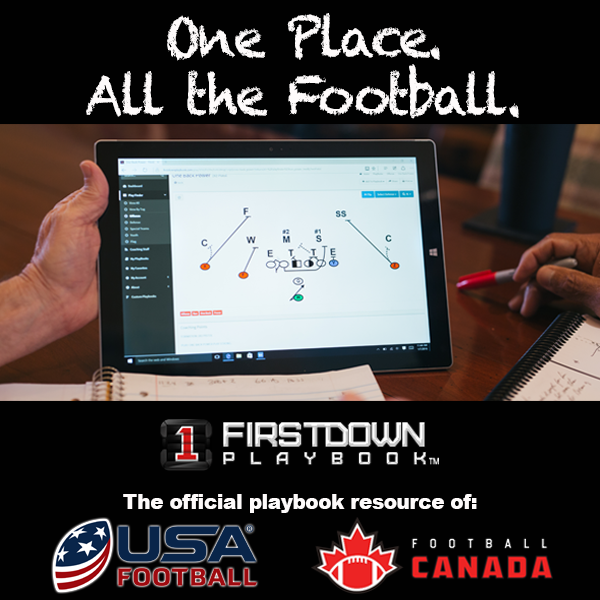 Today FirstDown PlayBook takes you through some of the thought process that you should possibly consider as you attack either a 6-2 goal line or a 5-3 goal line defense.